I need to be where? I realise I'm nitpicking because I'm still bitter about recent events, but for a feature which is supposed to make the experience more immersive this seems sort of fail. Yesterday I was giddy. Today I am depressed. At first I didn't take the leaked CCP newsletter thingie seriously. Could be a hoax, could be a joke, could be a lot of things. Then it got confirmed that it was for real. I am depressed and I feel betrayed. I need some sleep. I've been reading too many threads and blogposts about this. Perhaps tomorrow I'll find some words of my own to express my disappointment. Right now I'm still giddy about the fact that I finally have legs! 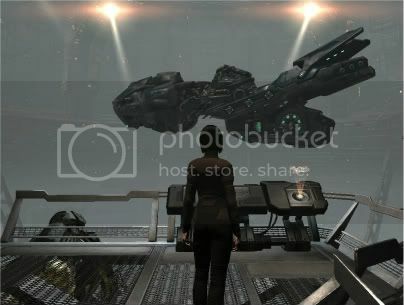 I remember going to Fanfest in '07 and being floored by the idea of a full-body experience in Eve, but the bright-eyed noob soon turned into a bitter vet whose words at the mention of Ambulation became "That's all very pretty, but I'm not holding my breath." I've been waiting so long for this that I don't much care by this point if our quarters are somewhat small and there isn't much to do but walk from couch to balcony and back. I know more will follow, and now this particular snowball is rolling, it'll follow soon. Ship spinning replaced by vegetating in front of a TV screen. I'm not yet quite sure what to think of that, but I have to admit the screen is rather hypnotic, even if it keeps trying to sell me Rifters, of which I already have tons. I am going to second that. The prices going on in there for ridiculously small things (like the eye implant) are through the roof. And to top that, these are things which, in good Eve tradition, you can lose if you get podded. So let me see, a month of gameplay or a new skirt: that's not a difficult choice. I'm not even tempted to buy any of the NeX items at those prices, which I imagine defeats the purpose. Perhaps I'm wrong but I assumed these were to be micro-transactions? They look rather macro to me. Sixth to dock. Again. And this time none of the Re-Aw members of her roster had shown up. Not a single one. So she had fleeted with reds, in one of her flashes of temper. She did seem to have a quicker temper whenever she was in her racing clone. But this time she didn't regret it one bit. She'd be damned if she was going to toss aside her personal beliefs plus her racing family and then be made to race alone. Facing Ciarente wasn't going to be pleasant, but right now it didn't matter one bit how much she liked her CEO. Kayleigh Jamieson-Read was feeling both angry and betrayed, and not one bit repentant. The official results aren't in, yet, but I managed to jot down my impressions of this race soon after, while things were still fresh in my mind. Follow the link and I hope you find it interesting reading. The jin-mei groaned. Sixth place. Sixth. She probably hadn't had a result this bad since Season 1 of the previous league. Sixth overall, sixth in her class - barring any time penalties the official results might uncover.